While tasting one of the brownies I knew I had done the right thing by buying Medrich’s new cookbook – cannot wait for it to arrive. Preheat the oven to 180°C/350°F. Lightly butter an 8in square cake pan, line with foil leaving an overhang on two opposite sides. Butter the foil as well. Melt the dark chocolate and butter in a heatproof bowl over a saucepan of simmering water until smooth. Remove from the heat and cool to lukewarm. In a medium bowl, combine the flour and baking powder. Set aside. In the large bowl of an electric mixer, with the whisk attachment, beat eggs, sugar and salt on high speed until the mixture is thick, pale and about double in volume. Fold the chocolate mixture into the eggs until partially incorporated. Sift the flour mixture over the batter and fold just until blended. Transfer to the prepared pan and smooth the surface. 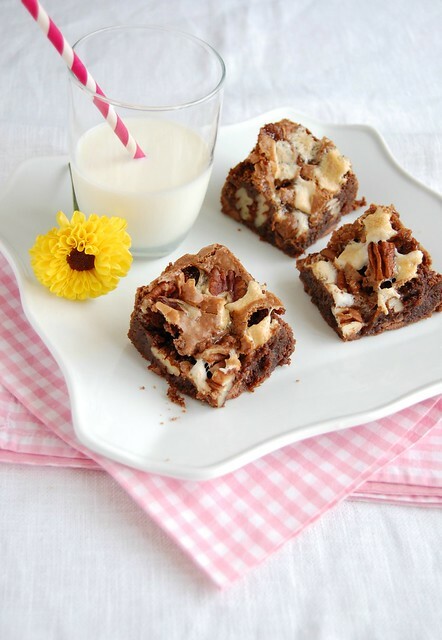 Distribute the marshmallows over the batter, followed by the pecans and the milk chocolate. Bake for 20-25 minutes or until a toothpick inserted in a cakey part of the brownies comes out with a few moist crumbs. Cool completely in the pan over a wire rack. Cut into squares. I've never met a brownie I didn't like. I love all the textures you've incorporated in these decadent treats!